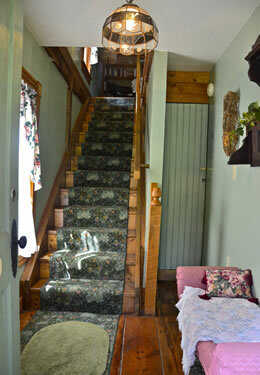 You can’t find a more perfect room than the top floor Carriage House at Highlawn Inn. 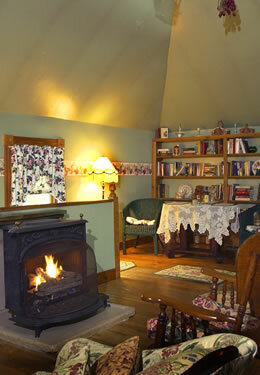 This tucked away restored room is expansive with a high vaulted ceiling featuring exposed beams. This room is spacious, yet has a very intimate atmosphere. Our glassed-in private bath is luxuriously equipped for romance. We have a pink, two-person whirlpool bath behind obliquely set French doors. Stunning antique, forest green, pressed-tin ceiling panels border the tub and create a rustic garden atmosphere. 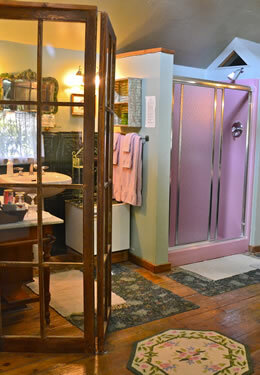 The bathroom is equipped with a refrigerator, pedestal sink, and enclosed shower. Special features guarantee a memorable stay in this room. 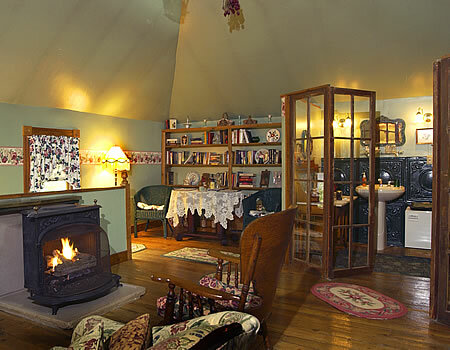 Explore the library nook, gaze through triangular windows, admire the stained-glass pieces specially made for this room, and enjoy the rustic feeling accentuated by the refurbished hay door.A gas fire stove is available to be used with an electronic remote, at the foot of the queen-size bed. You will find comfort in the attractive furniture, including a customized corner cupboard hiding a color TV. Original cedar siding encloses the Carriage House in a red, warm glow. This escape offers an affordable stay for two at $205 per night.